ADRAME…who? 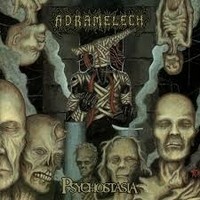 Finnish well kept secret ADRAMELECH were ahead of their times and ought to be given a spell in the limelight. The band, named after a Syrian sun god, has been a going concern since 1991, but is now described as “on hold”. Two demos in 1991 and 92 resulted in two EPS “Spring of Recovery” (1992) and “The Fall” (1995). Then came this album on Repulse in 1996, before the full-length “Pure Blood Doom” in 1999 and “Terror of Thousand Faces” in 2005. Six people have passed through the ranks and the last known line-up is; Jarko Rantanen (ex. DEMIGOD), drums, bass, guitars, vocals, Jari Laine (TORTURE KILLER), guitars, bass, and Marko Silvennoinen, vocals. This release adds three exclusive live bonus tracks. From the opener “Heroes in Godly Blaze” to the closing moments of “Seven” (live) there are s much more depth than most death metal bands have to offer. Progressive death might be the best term for this lot. The drums are never grinding, yet still very heavy and well-suited to the music in a classic 90-ies death way. The vocals are less black-inspired and very to the point...too. I really love “The Book of the Worm”, “Mythic Descendant”, “As the Gods Succumbed”, ”Across the Grey Waters” and the live rendition of “The Sleep of Ishtar”. The surprise is mainly the band´s prog take on things with unique solos, set to a love nineties death metal frame. Buy it!